Domenikos Theotokópoulos or El Greco was born in Crete in 1541. He moved to Toledo in 1577 after years of apprenticeship in Venice and Rome. El Greco's paintings have raised many questions as to why his subjects are elongated. Some theorists believe this is a result of an impaired vision. Others advanced that El Greco was merely using his own painting fundamentals to create what he envisioned as natural beauty. Nonetheless, El Greco left an enduring body of works. Many of the paintings on view at the Museo del Greco belong to the later period in his career including the Apostolate series. He died in Toledo in 1614. 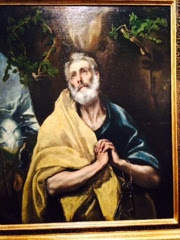 In the painting above, a repentant St. Peter is portrayed with tears in his eyes. St. Peter is begging for forgiveness after denying Jesus Christ three times. The theme of repentance was common in the late 16th century.